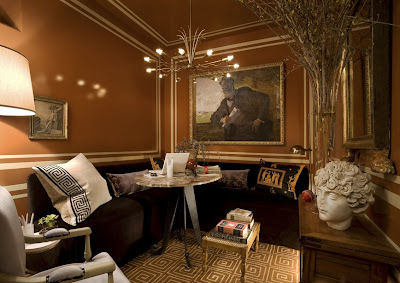 The best part of attending the press tour for the 2009 Kips Bay Decorator Show House is that I was able to speak to most of the designers directly and ask them questions. Most of the established interior designers usually take one of the larger rooms in a show house because they can afford to decorate them. They have great relationships with many vendors and workrooms and since their clients usually spend a lot, they are able to call in favors and get many goods and services donated. Younger designers without deep pockets usually choose a smaller room but as is the case with interior designer Garrow Kedigian, they can often make a big impact in their small space! Garrow had just 95 square feet to work with on the 5th floor of the Show House but it's full of great style and design ideas. 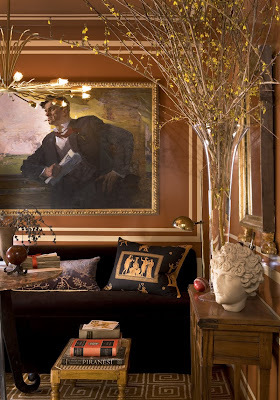 His inspiration was actually a room he had created for a client on Park Avenue who was a psychologist who wanted a room of her own to get away from her husband and children. He turned a small maid's room into a multi-use space where she could read and eat and get away from all the hassles of her day. Couldn't we all use a room like that?! 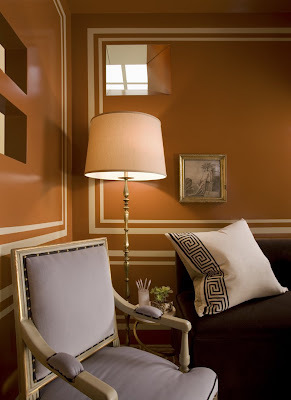 The room was painted a lovely orange/brown color which were varnished to create a sheen that reflects light. There were absolutely no architectural details in the room so Garrow created them using paint, an easy trick that anyone could try at home. We discussed how hard it is to choose a paint color and he tried about four colors before settling on Benjamin Moore Terra Mauve. You really need to try paint out in your own space so you can tell how it will look because it can look dramatically different in a magazine or online. They can even look different in regular photos as you see from the first two photos that I took and the last three that were taken by Bruce Buck. Of course, Bruce is a much more talented photographer than I am so that might also have something to do with it! What's so great about the space are all the details that you only start to notice as you look around the room. The banquette was a great choice since it anchors the room and doesn't take up as much space as a regular sofa might. The pillows were actually made from fabric samples but don't tell anyone! The marble top table from Amy Perlin Antiques serves as a dining table and work space. The Greek key motif from the pillows is picked up in the custom rug which also complements the wall color. There are many classical elements that play off each other including the large painting of the Russian post, Mayakovsky that was found rolled up in another client's attic! Outside the room is the skylight so Garrow opened up the wall near the ceiling to allow for a mirrored oculus and two other "windows" on the side wall let more light into the small room. The mirror on the other wall also helps open up the space. This was definitely one of my favorite rooms and I heard that interior designer legend Mario Buatta also declared it one of his favorites as well! Just goes to show you that big things come in small packages!